All most women want for their wedding day is sunshine, happy guests, and to look and feel fantastic. Brides have probably had a long and busy few months in the run up to their wedding, and by that point they are in need of some calming, relaxing me-time and a chance to get excited about the big day. So what better to get ready from head to toe, than a beautiful, healthy tan, a professional rejuvenating facial, and a full body massage treatment, all by beauty experts Crystal Clear. To achieve the perfect wedding day tan, skin should first primed with Crystal Clear Body Polish, to get rid of dead skin cells. Sixty seconds is all it takes for the tan to dry, leaving skin instantly smooth and fresh with a natural golden glow, all in less than 15 minutes! Your tan will last around a week, before fading beautifully and evenly. A Crystal Clear COMCIT™ facial treatment takes just 45 minutes and results are immediate thanks to the simultaneous action of the four rejuvenation technologies. Skin will be beautifully plumped, tauter and more hydrated. And what’s more, results can only get better as new collagen production is kick-started around day 14. For the totally rejuvenated skin every woman wants for her wedding day, a course of six treatments is recommended, taken at fortnightly intervals. 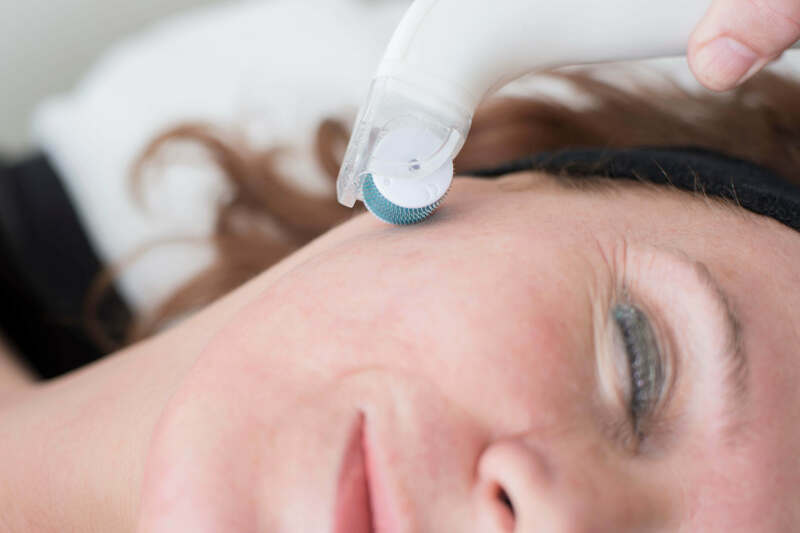 A Crystal Clear COMCIT™ facial combines four of the latest anti-ageing technologies to stimulate new collagen production, significantly reduce lines and wrinkles and rejuvenate skin texture and firmness. This unique, minimally invasive treatment, delivers cryo-oxygen, skin infusion and oxygen simultaneously to the skin through tiny microneedles which create hundreds of microscopic channels in the skin, delivering the powerful rejuvenation actives into the deeper layers of the skin where ageing begins, essentially tricking the skin into acting young again. Multi-purpose, COMCIT™ is not only effective in the treatment of the face, neck, décolletage, and acne scarring, but also on the body, in the reduction of stretch marks and cellulite, as a treatment for ageing hands, as well as a firming treatment for upper arms, stomach, and thighs, should brides be conscious of other parts of their body. Every bride wants to feel confident and happy in her dress, she’s probably spent weeks, if not months searching, debating and trying on dresses, so how she feels in it on her big day is so important. Our unique system combines a vacuum with a unique pulsed program, helping to release the fat from the tight connective tissue which holds the fat cell and expels toxins and water. The skin is smoothed and firmed from the very first treatment. To enquire about any of these treatments, use our salon finder to locate your nearest Crystal Clear salon and book an appointment.